If your company exhibits at festivals, street fairs, or other outdoor events, chances are pretty strong that you’ve used an event tent before. Whether you have or have not personally used one, you probably already know that they’re effective at protecting employees and customers from the elements. But truthfully, a printed advertising tent can offer way more than merely protecting you and your customers from the sun or rain. When you choose an appropriate event tent for your business, it can also be a cost-effective way to further your company’s reach by showcasing your branding and allowing you to display your products or services in a professional, eye catching way. Here, we’ll explore 6 things you might not know about event tents; this can help inform you about the many ways that they can benefit your business, as well as help you decide which type might be best suited to you. They start at very low prices. For many business owners, the idea of investing in an event tent immediately causes a blood pressure spike. And while certainly there are more involved and expensive models available, it’s possible to invest in a basic event tent at an extremely affordable price. 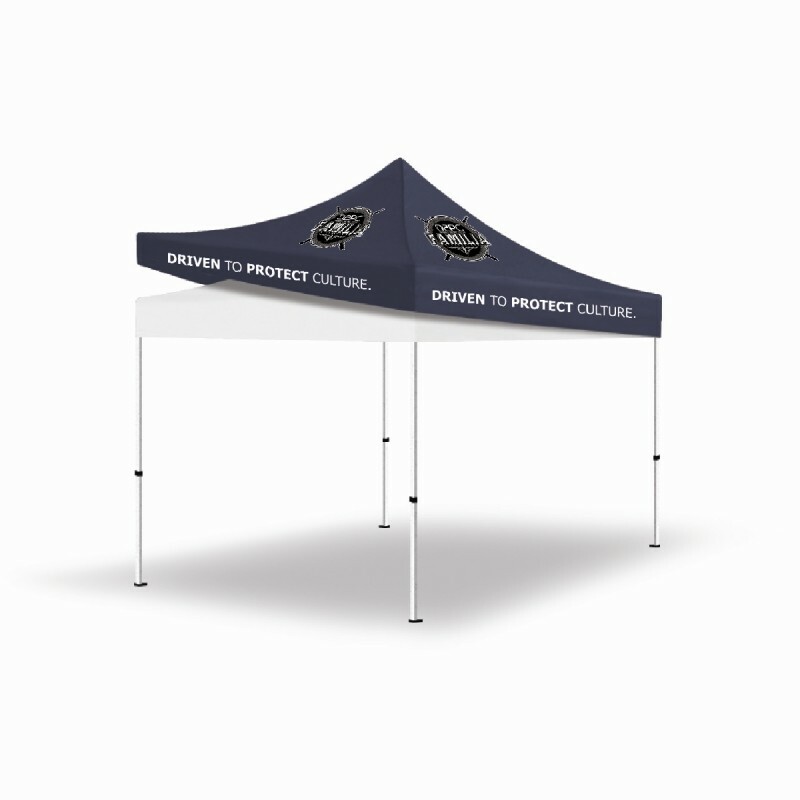 For as low as a few hundred dollars, you can purchase a customized event tent which showcases your company logo and branding. All things considered, this is an extremely low amount of money when you consider the hundreds and thousands of eyes which will view and be exposed to your company. Event tents are far from a “one size fits all” model. There are literally options for every type, size, and style of business. Our basic pop-up tents, available in a number of different sizes, from small (about 5 by 5 feet) to huge (20 by 20 feet), can be personalized to suit your needs, and offer a number of different solutions in a simple, square or rectangular format. But that’s just the beginning. Above All Advertising also offers a number of exciting alternative formats for event tents. From inflatable tents which can be assembled in minutes using cold air to completely sealed units to the impossible-to-ignore teepee tent, which spans 40 feet long and wide by 20 feet high, there’s an option to make the impression that you want at any and every level. They can expand your retail area. Say you have a retail store that spans 1500 square feet. That’s a decent retail space to display and sell your products, but an event tent can make your retail area even larger...and a lot more effective. Picture this: on a sunny day, you set up an event tent in your parking lot or in a space in front of or adjacent to your store. You can set up more retail space under the canopy of your tent, easily increasing your selling space! Plus, by setting up a retail area outdoors, it creates a safe, interesting space for potential customers to check out your offerings in a low pressure atmosphere, without being “sealed” in the store. Whether you use the space to spotlight new products or use it as a sales area to draw passers-by, it’s hard to underestimate the power of expanding your selling space. Canopy caps can be swapped. This is huge: by swapping out your canopy cap, you can use the same canopy tent over and over, but personalize it with different graphics depending on the event. Basically, you can invest in the “shell” once, and then use a personalized, fitted canopy cap (available in a variety of sizes) to personalize the tent. This means that the same tent will appear to be a completely new and different thing from event to event. This can potentially double, triple, quadruple (or more) your initial investment! When you think “event tent”, you probably think of a static fixture. Well, that part is mainly true. But static doesn’t have to mean boring. There are options available under the category of “event tent” that can serve as engaging, enticing structures which can invite customers to come and play (and better yet, discover your company). A pop-up tent station, for instance, provides a function (changing station) which will invite customers to come inside, at which point they will be exposed to your branding. Another example of an engaging event tent option is the Customized Hoppin Pop™ Tent. This funky, small tent is guaranteed to garner consumer attention as they ask “what’s going on here?”. It almost makes it a game; that nostalgia can immediately make customers receptive to what you are offering by giving you a fun and easygoing conversation starter. They don’t have to be confusing. This might surprise you, but choosing and ordering an event tent need not be a stressful event or even the cause of confusion. One option to reduce confusion? Order a kit. Event tents can be ordered as kits, which takes plenty of stress out of the process by supplying you with all of the tools that you need to make your tent not only happen (nobody likes ordering a tent, only to realize that they need to order support cables!) but shine. Another option? Consult the experts. If you get confused looking through the Above All Advertising site, reach out to our friendly customer service team. They can take a lot of the mystery out of the process of ordering the perfect event tent for your unique business. Conclusion: Event tents are an invaluable way to help increase your company’s reach and share your brand with the world. By taking the time to consider which event tent is the right solution for you, you’ll be investing in the future of your company and helping to build potential sales. So go ahead, check out the vast array of offerings on the Above All Advertising website. See for yourself what an event tent can do for you and your business! Have you ever used an event tent?